What Makes the Best Anti Spam Service? Different businesses often have different priorities when looking for an anti spam service. Some will want the highest level of protection against email-borne threats such as phishing, malware and ransomware; whereas others will want a high degree of versatility in order to apply different acceptable spam thresholds to different groups of users. For cost-conscious businesses, price is obviously an important factor, while smaller businesses without the resources of a large IT department would prefer a set-and-forget anti spam service that has minimal maintenance overheads. Ideally, businesses would like all of these priorities present in their anti spam service, but that is not possible. Or is it? SpamTitan´s anti spam service fulfills all the about criteria and much more. Using multiple front-end filtering mechanisms, SpamTitan has a verifiable spam detection rate of 99.97%, and uses advanced “greylisting” filtering techniques to identify spam from previous unknown sources in addition to the more commonly-used RBL, SURBL and recipient verification techniques. Other optional mechanisms available to system administrators include Sender Policy Frameworks (with HELO tests if required) and Reject Unknown Sender Domain tests to prevent sophisticated spoof emails avoiding detection. Businesses concerned the delivery of genuine emails may be identified as spam in error can add trusted senders to a whitelist in order that their emails bypass the front-end mechanisms. The reason why some businesses want to apply different acceptable spam thresholds to different groups of users mystifies people with the mindset that the highest level of protection against spam is the best protection. That is not always the case. Businesses who receive sales leads via email from multiple sources may want to relax the acceptable spam threshold for their Sales Departments. In sales, a fast response to an enquiry is often more successful than a late one and, should an incoming sales lead be incorrectly identified as spam, it may remain in the quarantine folder for a considerable amount of time – allowing a competitor to steal the sale. SpamTitan´s anti spam service allows system administrators to apply different acceptable spam thresholds to individual users or groups of users with the click of a mouse via the setting on SpamTitan´s centralized management portal. Compared with the cost of recovering from a malware or ransomware attack, SpamTitan is very cost-effective. However, all anti spam service providers would say that. What really makes a difference is the high spam detection rate compared with other leading email filtering services. If employees receive less incoming spam email, they spend less time dealing with it and increase their productivity. We calculated (here) a business with sixty-seven security-conscious, office-based employees could lose $2,680 in productivity each year through dealing with spam emails (based on the average detection rate of the top ten email filtering services tested by independent testing site AV Comparison). SpamTitan cut the cost of lost productivity to $894 and typically costs less than $10 per employee per year. How Few Maintenance Overheads Would You Like? When it comes to ease-of-use, it doesn´t get much easier than with SpamTitan´s anti spam service. Deployment – either as a Gateway solution or as a Cloud-based solution – takes just a few minutes, after which system administrators select which front-end filtering mechanisms they want to enable and which settings they wish to apply to which groups of users if not using a business-wide filtering policy. It is possible to schedule quarantine reports and whitelist trusted email accounts if required, but thereafter everything else is done by us. The RBL and SURBL email filters are updated in real time, as are the dual antivirus engines that scan both inbound and outbound emails for malware. All software updates are performed remotely by us and, if you ever encounter a problem, our technical support team is available around the clock to resolve your problem quickly and to your satisfaction. If you have tried other anti spam services and found them disappointing, inflexible, too costly or too complicated – or you have never tried using an anti spam service at all – you are invited to contact us a request a free trial of SpamTitan. Our team of Sales Technicians will discuss your requirements with you in order to determine the most appropriate deployment option and guide you through the process of starting your trial. 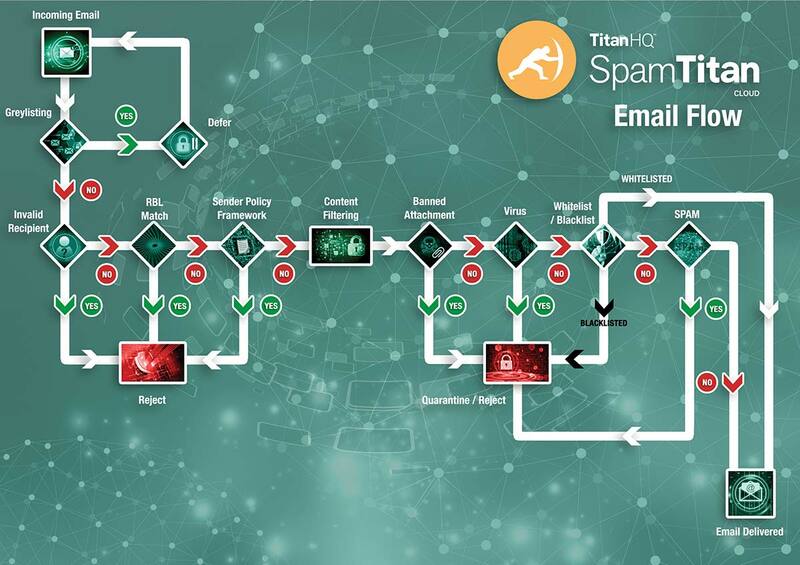 Naturally, we will be happy to answer any questions you have about our anti spam service, and explain more about how SpamTitan has the key mechanisms to minimize email-borne threats such as phishing, malware and ransomware – with relevance to your own particular situation. Contact us today to find out more and start your free trial.